I want to draw shapes looks like 15 degrees tilted-semi-sphere and there are circles, placed in a triangular shaped array, on the base area. 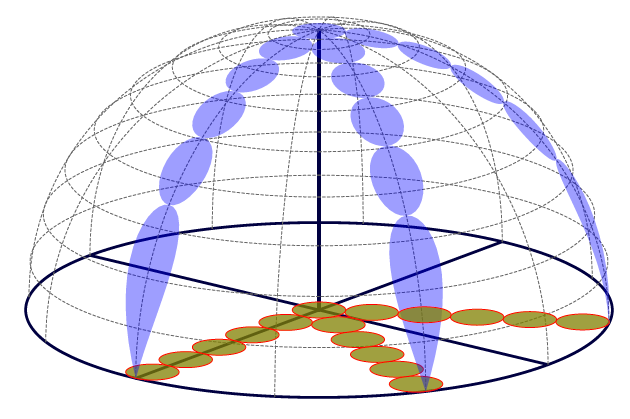 Then these circles are projected onto surface of sphere. I can drive small circles on the base-plane. 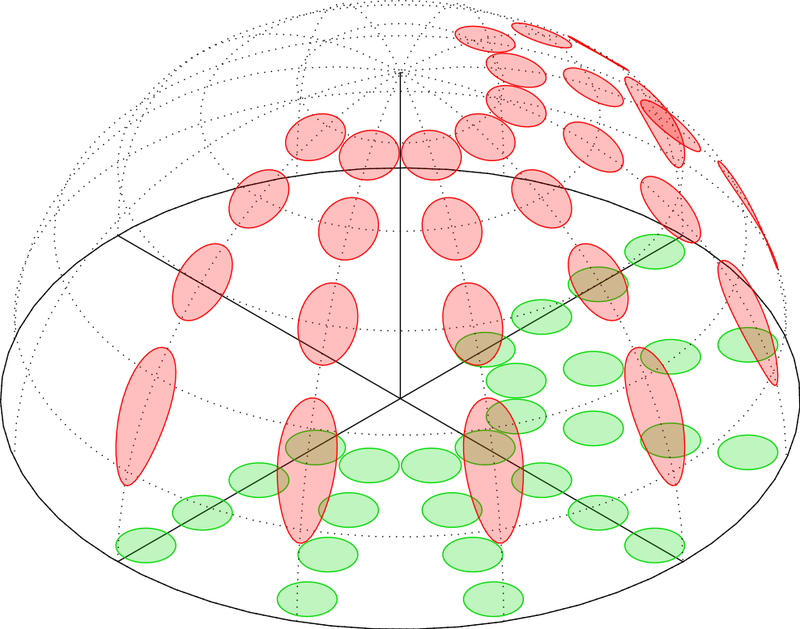 However, projections of circles have different shapes. Therefore I don't know how to solve it. 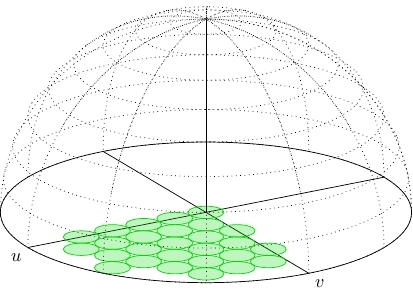 I think, there are cylindrical holes and I must find their intersections on the surface of sphere. Thank you all for your response. 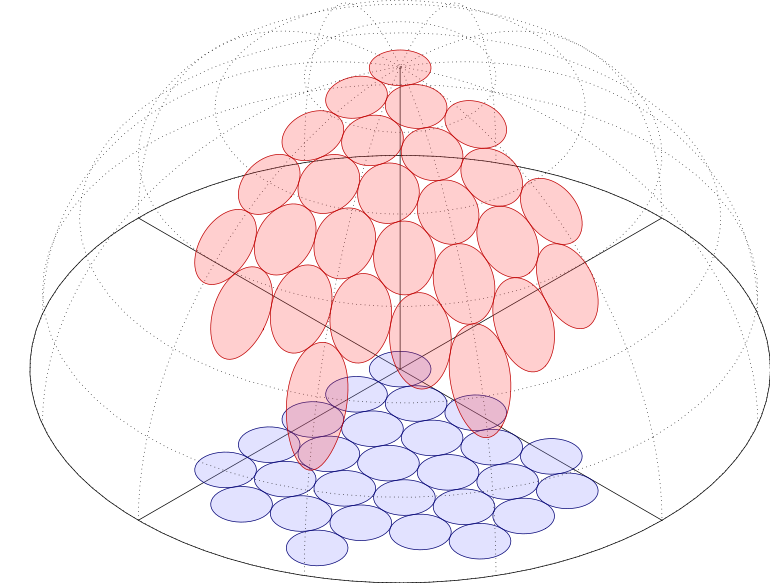 I wonder is there any way to specify centers of circles or projections in cartesian and not in polar coordinates. 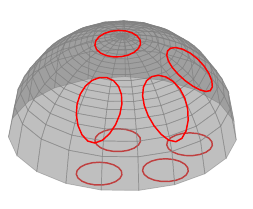 Since it is difficult to specify polar coordinates of each small circles, shown below, in an automatic way, in other words using \foreach command. Well, no prizes for speed (not just because there is some duplication of calculations: TikZ is slow for this kind of stuff), but this shows one way of doing it. I expect asymptote/PSTricks could do it quicker, but I don't see any other way of doing it in TikZ. The maths is straightforward "back-of-the-envelope" trigonometry (in this case literally). The only "insight" is to draw the circles manually. EDIT 1 inspired by Jake's missing (at the time of writing) PGF Plots answer, I've changed most of the \foreach statements to TikZ plot commands which makes things a bit quicker. EDIT 2 changed the critical function to sqrt(\R^2-(\cx+\r*cos(\t))^2-(\cy+\r*sin(\t))^2) as this provides better accuracy than veclen when the circles get near to the edge. EDIT 3 a second version has been added which uses layers to add both circles at the same time. To get a standalone s.pdf run asy -f pdf s.asy. Not the answer you're looking for? Browse other questions tagged tikz-pgf 3d tikz-3dplot or ask your own question.